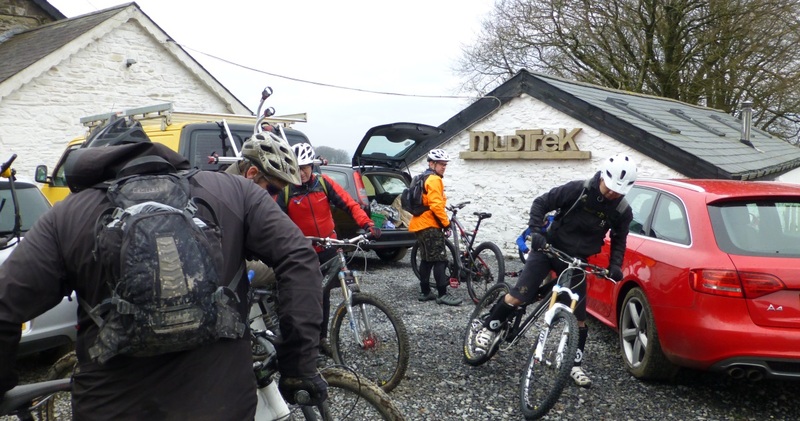 After an amazing cooked breakfast served by our hostess Nikki Channon the pre-ride preparation was underway as riders emerged from the warmth of the farmhouse and bikes were collected from various bike racks, shelters and car boots. We set off soon after 10.00am (after very little faffing due to the cold) on what was a surprisingly dry day; that’s dry as in nothing was falling from the sky, it was certainly going to wet under our wheels soon enough. After the first mile and half with only a little climbing required we had our first downhill treat. We dropped around 400 feet in just under a mile on some great single track – the first section was a serious of giant steps with our first of many puddles at the bottom and the next part was a little steeper with loose slate and rocks to keep you on your toes. Oh and another puddle. The smiles and high spirits had begun. 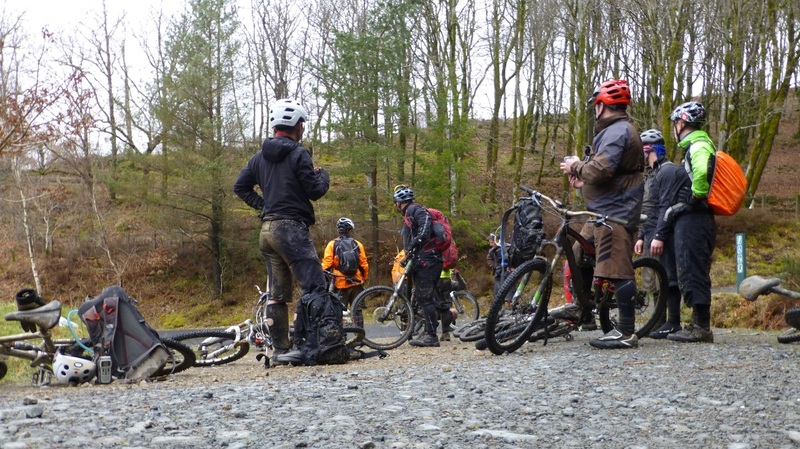 The next few hours were dotted with fire roads, wooded single track, ups and downs and a very lengthy section of boggy, puddled track which at times was well up over “dry feet” height and over the knees deep if you were unlucky enough to have to put your foot down. This was both fun and tiring. The thought of getting wet feet so early on a cold day was not pleasant, though watching your fellow riders getting wet somehow seemed to balance this out and caused more than a few outbreaks of laughter. The downward sections were a welcome treat and a fast swooping track down to a farm-house gave all of us a chance to let loose. There were a few sketchy moments for one or two as at least one us got tangled in some brambles hanging at the side of the track. This snagged on a jacket and yanked him up the banking – Phil is a good rider and this had all the potential of a major off but his speed carried him through this – his jacket did suffer a bit of a tear. 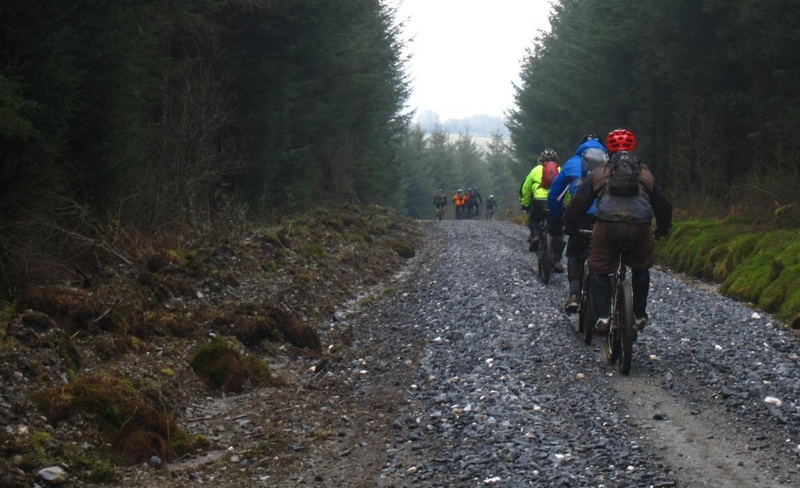 The narrow river crossing at the bottom of this section marked one of the lowest altitude points of the ride and from here (I think) we made our way gradually up through Brechfa Forest and joined part of the Black graded Raven trail, designed by Rowan Sorrell and Brian Rumble. By the time we reached the top I was hurting. Having not ridden the bike for a few weeks I was beginning to flag and by now really needed to go down hill a bit. 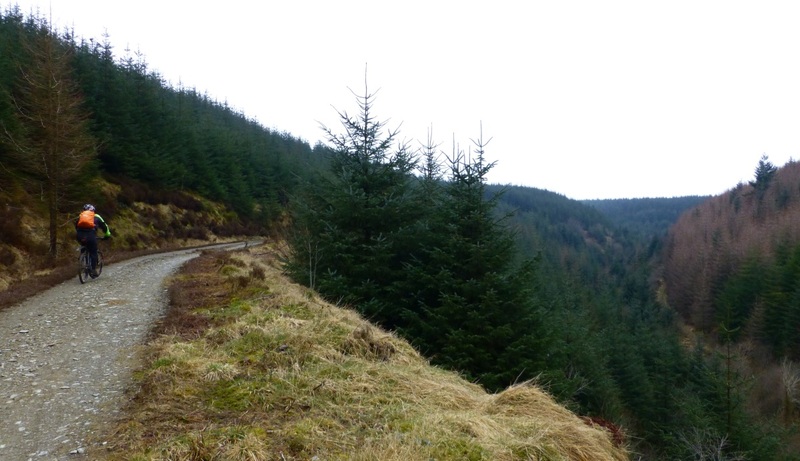 So to start with we had some tight single track through some mossy and damp forest. This section was technical and twisty with some cheeky little drops, challenging roots and a few little jumps and tight turns thrown in for good measure; all the while letting gravity and momentum carry you through. This was more like it! More of the same followed, this time requiring pedalling but equally as good a section where you were desperately trying to catch the guy in front. 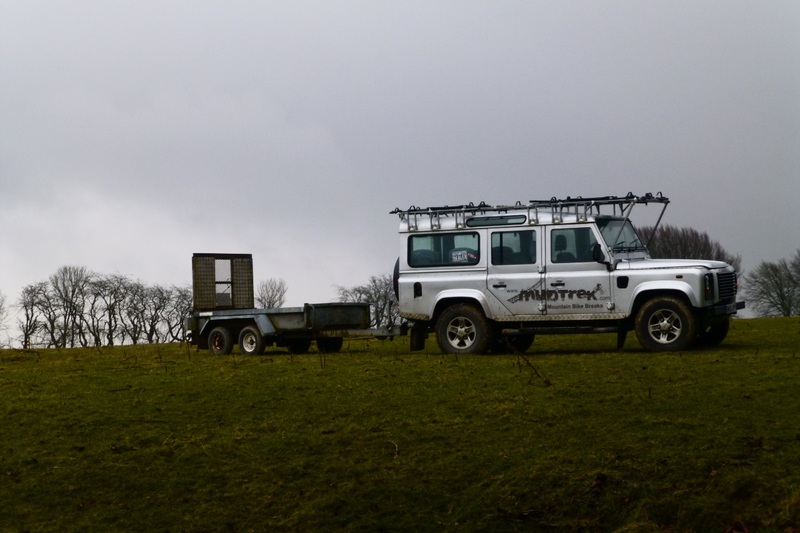 Amazingly at this point – in the middle of nowhere – we bumped into the owner of the digger that MudTrek were using to build the new skills loop. A bunch of the MB Swindon gang had been staying at MudTrek before the weekend ride, assisting Jay with the trail building and they did an amazing amount of work in just a few days. The Raven trail is rated Black, and this can mean a few things. Ultimately its a grading of your ability as a rider and will be a mixture of the length of the trail and the type of obstacles you will find on your way. We were about to descend through one of the best sections before our stop for lunch. 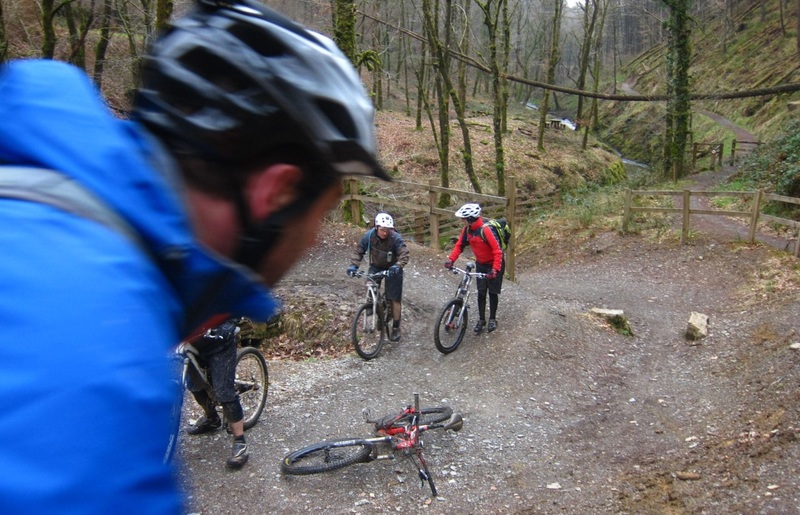 What followed was a drop of around 700 feet littered with some fantastic man-made berms, jumps and switchbacks. Quite steep in places, though all rideable with even a medium level of skill. If my memory serves me correctly we had one more short climb and then we dropped down again for another steep section, most of us had some fun hitting a jump a few times to get some air under the tyres. I should point out at this point we are mostly 40+ year old males and a sufficient amount of air under the tyres can be as little as a foot for some. I need to point this out as the video will surface soon of me being a whopping 6 inches in the air! 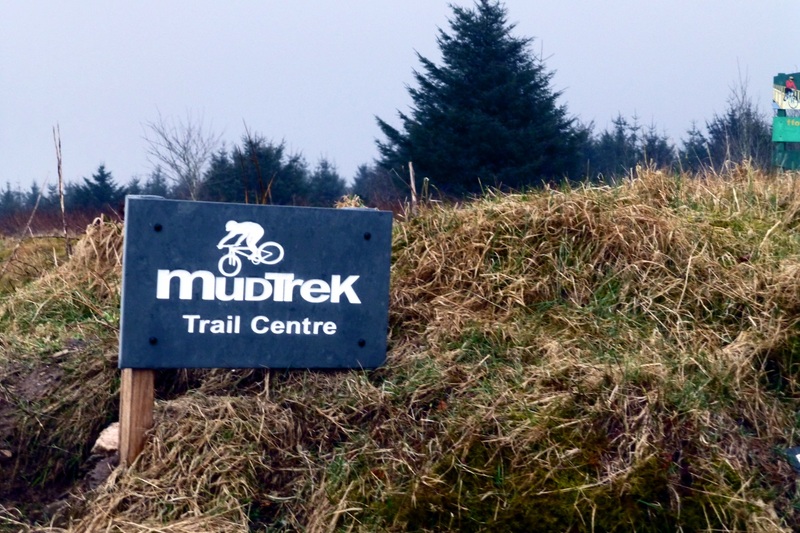 Lunch consisted of rolls, crisps, chocolate bar, cake and a banana – all provide by MudTrek and included in our package. The photos above weren’t the “official” lunch stop by the way, this was an unscheduled break as we waited for a broken bike. 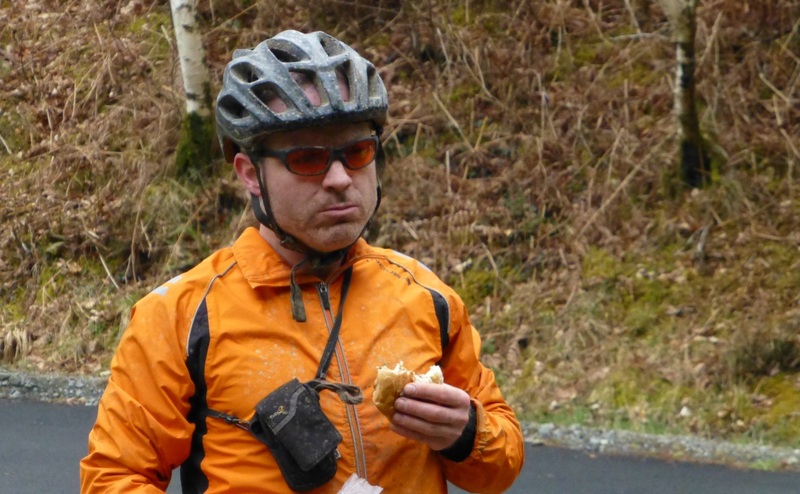 Long story but one of our guides (Rich) had to take a bike back and I am still not sure if he fixed it or swapped it. Either way he took Jay’s bike back at this point and met us at our actual lunch stop having gone back to the farmhouse. While I am typing this the order of events is reordering itself in my head but I am not going to rewrite it! Where was I? Oh yes we had lunch and then we spent 3 hours going back. I would like to gloss over this part as it kind of brings me back to where I began. After the highs of the Raven and also some of the Gorlech (again I can’t remember the order), a number of us began to feel a bit drained of energy. At the beginning of the day there was much debate on the number of layers to wear. It certainly was a cold start, but as soon as the pedalling started the temperature was comfortable. In places it dropped a few degrees, but on the whole it was comfortable weather to be riding in. But at the end the temperature began to drop rapidly and the wind picked up as we were on the top of the mountain. I remember talking with Richard at one point and we couldn’t figure out what was wrong as it looked like we were going down but felt like we were pedalling up. A trick of the scenery perhaps or just a sign of how tired the legs were getting. There was one high left for us though – a long newly laid road with a gradual decline meant that we had one last chance to let loose. Hitting speeds of a 45-50 mph on the road we were all smiling again at the sound of our knobbly tyres on the tarmac and the rush of the wind in our ears. 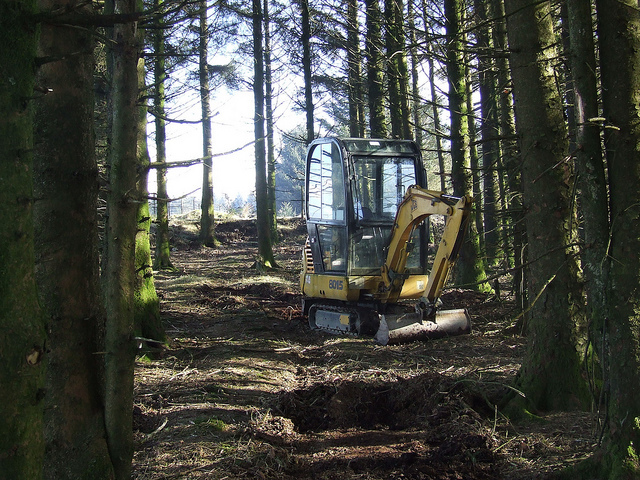 This really was fun – for a road! We then had more road and it seemed endless. As the temperature dropped to around -4C the last push really was a push. Drained of everything and now very cold it was preservation time for the stragglers of the bunch. Walking meant that we could circulate the blood in our gradually freezing toes; fishing out the beanies, bluffs and putting hoods up was the only way to keep faces warm. It was a tough finish. But we all made it. 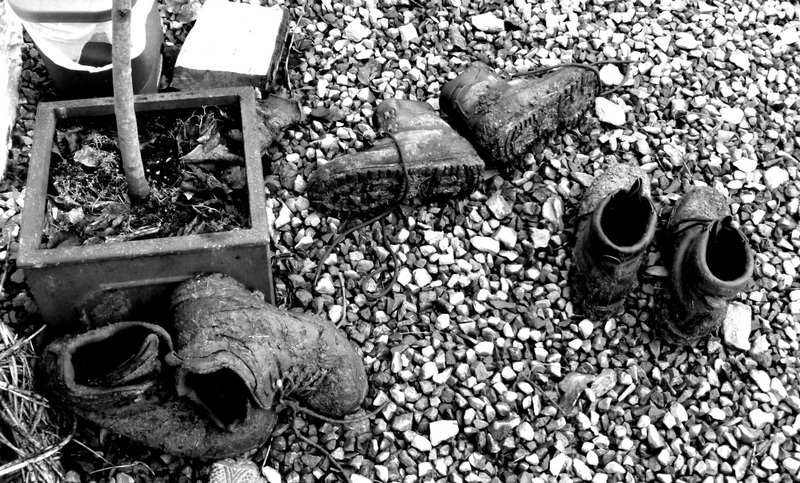 Some in better shape than others but no matter what we all knew we had achieved something. This was my first ride with MudTrek ride and weekend away with MB Swindon and I will be doing it again in October.. Thanks Jay for the ride, Nikki for the food, Tom/Rafe et al for organising and the rest of the gang for the company. Once I get in front of a PC I will add credits to the photos not taken by me, it’s tricky on an iPad to add the credits afterwards. But the ones not taken by me are courtesy of MB Swindon and MudTrek. Sounds like a fantastic adventure. Great write up. Sounds great fun! 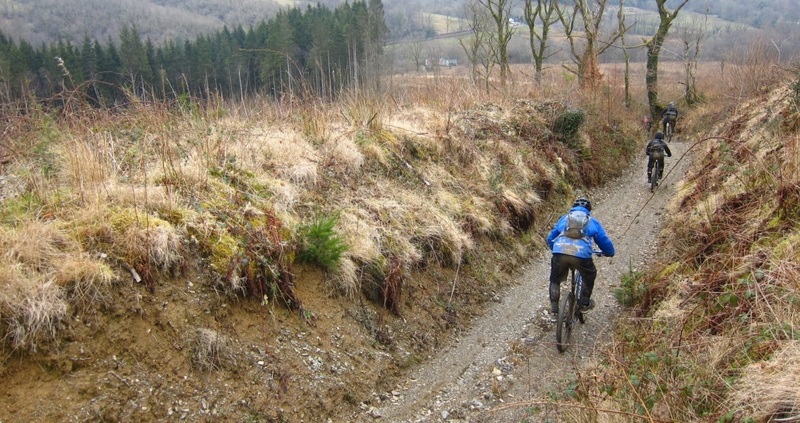 From what i’ve gathered on the internet it seems Wales is the place for biking!